The National Botanic Garden of Wales. The National Botanic Garden of Wales is one of our favourite places to visit in Wales. The National Botanic Garden of Wales was opened to the public on the 24th May 2000. We first visited in 2005. The double walled vegetable garden was not open then, you could however view it from a platform. It has now been rebuilt from a ruin. The double walled vegetable garden in 2005. Our next visit was in 2013. The 220m long avenue which divides the Garden is known as the Broad-walk. One of the longest herbaceous borders in Britain, from spring to winter, this Garden provides a colourful welcome. It begins at the Gatehouse, passing this water sculpture called Scaladaqua Tonda. I particularly love this rill, it runs the full length of the Broad Walk, vanishing into pools along the way, starting at this dragon topped mirror pool. a meandering stream that flows down the Broadwalk with a shape and course that is inspired by Carmarthenshire’s Towy Valley river. Designed by Foster and Partners, is the largest structure of its kind in the world. The structure is (312 ft) long and (180 ft) wide, with a roof containing 785 panes of glass. The plants are divided into sections from Chile, Western Australia, South Africa, California, the Canary Islands and the Mediterranean. Designed by professor Fukuhara for the 2001 Chelsea flower show, it won a gold medal and best in show, after which it was recreated here. This is a place of learning, perched upon stilts this wooden building is full of microscopes and study aids, here schoolchildren can get the opportunity to explore the wonders of nature. Situated in the Walled garden. It was designed by the world-renowned Welsh architect John Belle, celebrated for his restoration of some of the most famous landmarks in the USA. 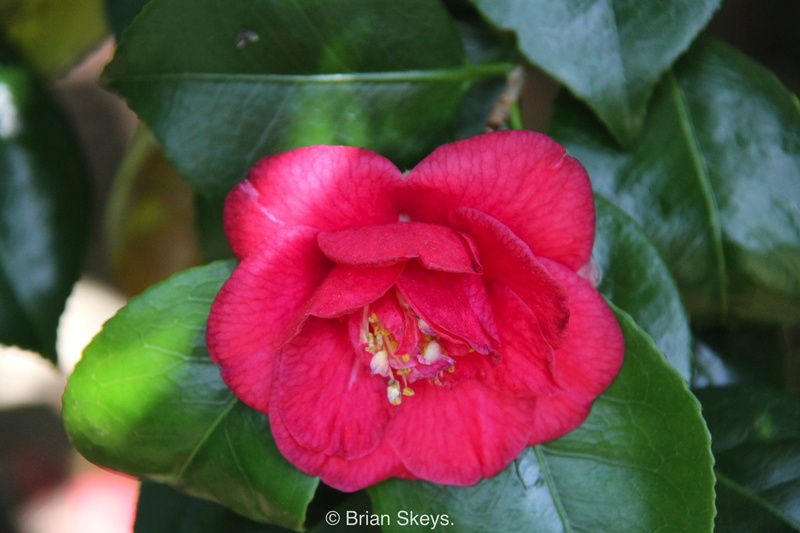 It is home to tropical plants and a butterfly house. When it was built 200 years ago, the Double Walled Garden, at over three acres, could provide enough fresh fruit and vegetables for a household of 30 people, and employed 12 full- time gardeners. The double walled vegetable garden in 2013. The two walls, one brick, one stone, provided shelter from animals and the harsher elements, and created important microclimates where tender plants could grow. It is divided into four quadrants, each with its own distinctive pathway. Part of the vegetable garden is given over to local School Allotments, where the schools have built a plastic bottle greenhouse. You can end your exploration at the Stable Block, this houses the Seasons Restaurant, Gift Shop and Oriel Yr Ardd Gallery. 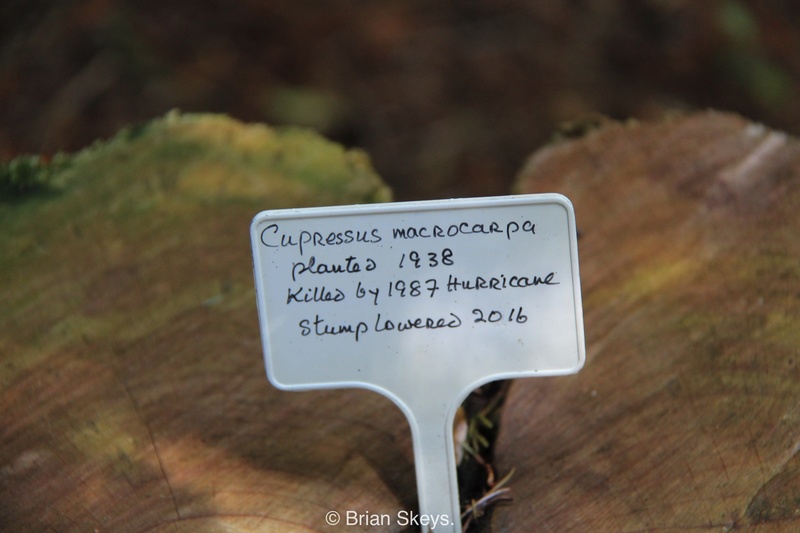 If you are planning to visit Wales during the year, we would recommend a visit to the Botanic Garden of Wales, there is much more to see than I have shown. 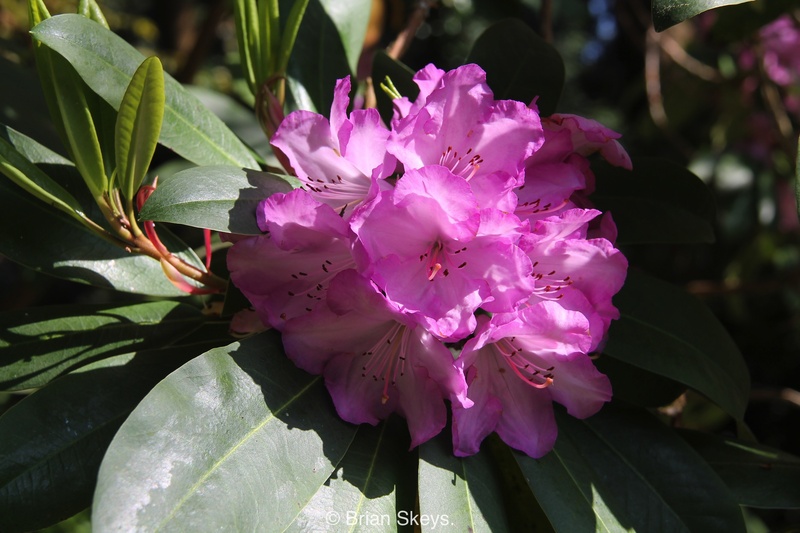 It also ties in well with a visit to Aberglasney Gardens, another favourite with us. Hats, Gloves, Scarves & Muddy Boots. On Wednesday we replaced our Hats, Gloves, Scarves and Muddy Boots with our ‘Wednesday Best’ to attend the Worcestershire County National Garden Scheme AGM and lunch. ( This being a charity, garden owners have to pay for their lunch). With the Chief Executive, George Plumptre, of the NGS in attendance, Our County Chairman, David Morgan presented an impressive report for the year. Following the AGM and lunch, we all collected our advertising material for the year, posters, direction arrows and signs to put around the garden. 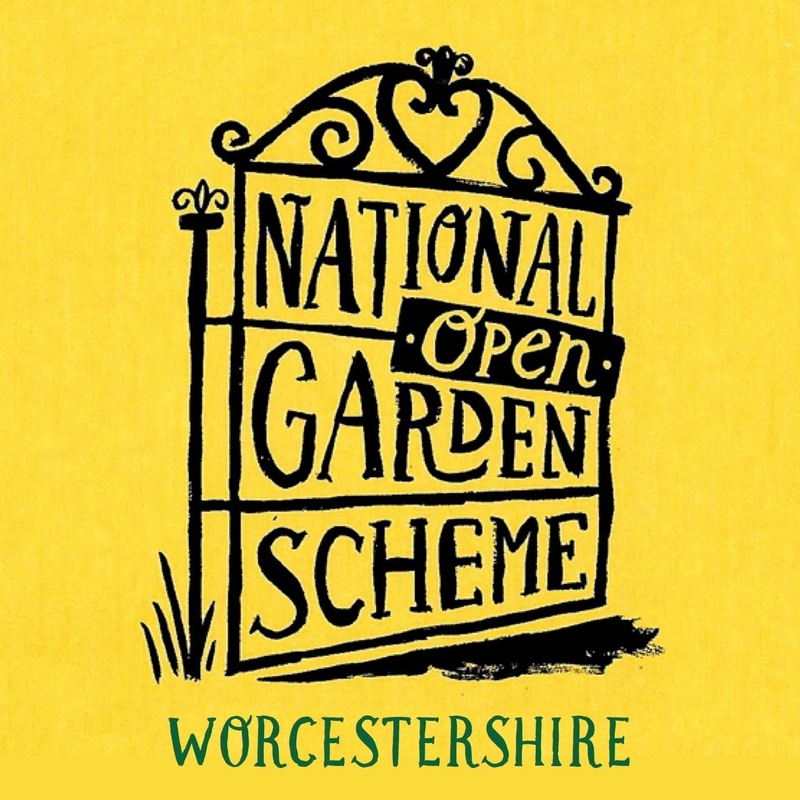 County booklets are distributed around various garden centres, shops, tourist offices and any venue where the public can accesses them. The Garden Visitor’s Handbook 2018, which covers all N.G.S. 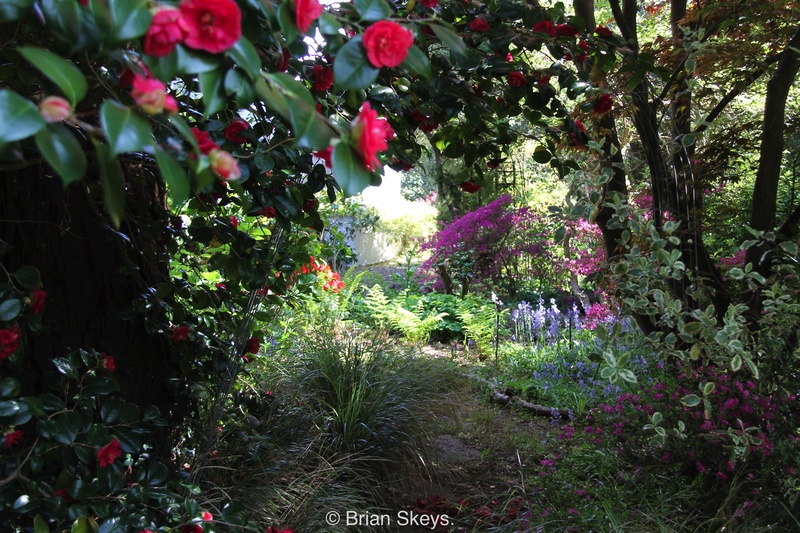 open gardens in England and Wales, is available from the NGS website. It makes an ideal companion for the holidaying gardener. The Hats, Gloves, Scarves and Muddy Boots were back on the next day, we have a deadline to meet! 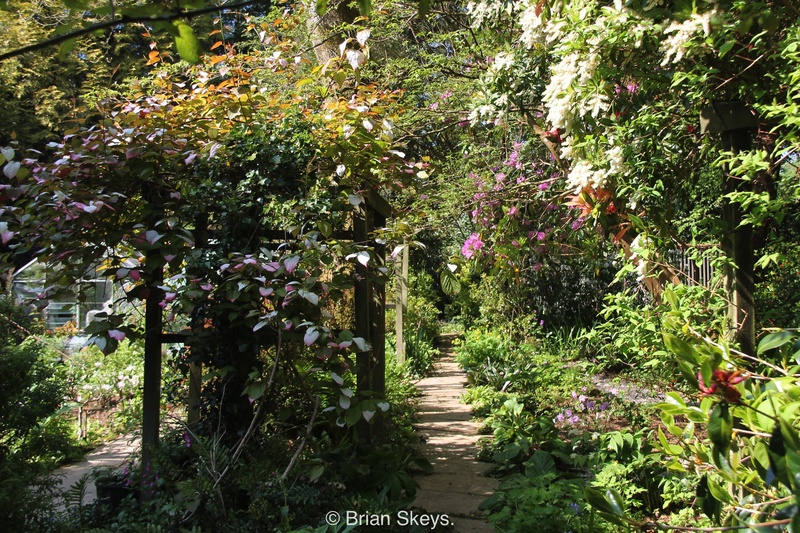 Do you visit gardens when you are on holiday? Wordless Wednesday 8th November 2017. Rhodochiton atrosanguineum. 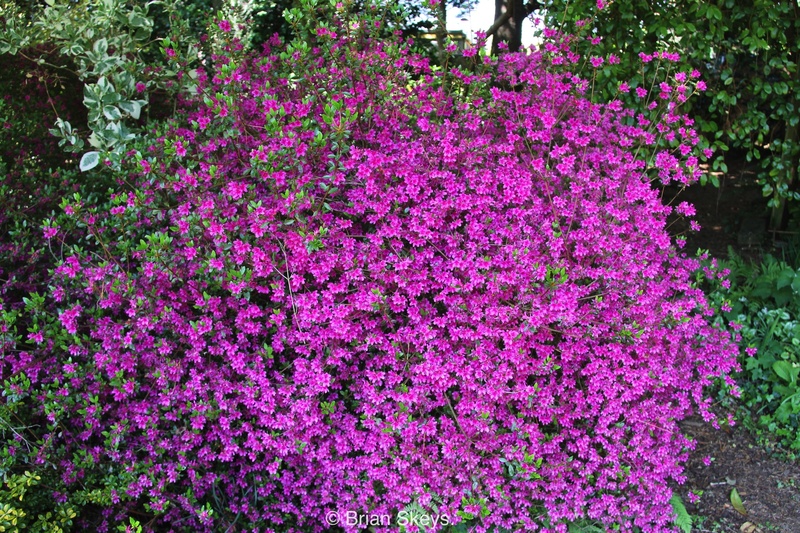 Purple Bell Vine. In May we had an enjoyable holiday in Cornwall, which I wrote about: here. 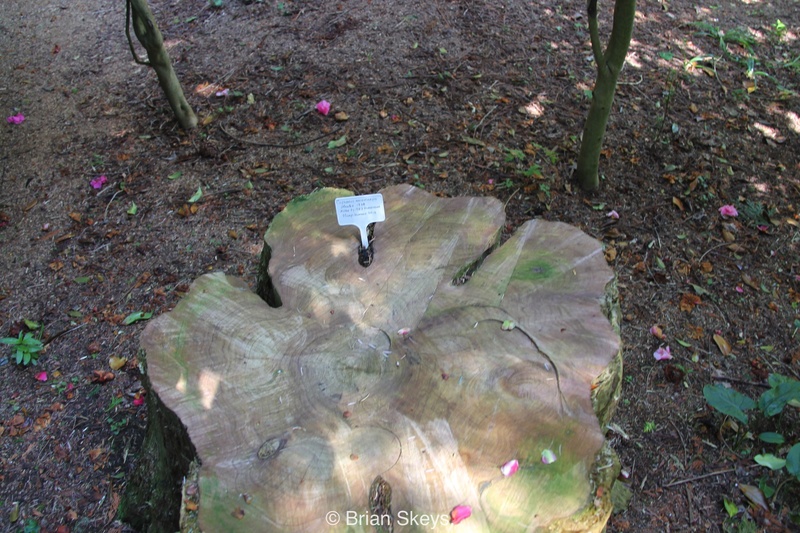 One of the gardens we visited, that left a lasting impression on us was the Moyclare Garden, near Liskard. This is the introduction to the garden from their website. 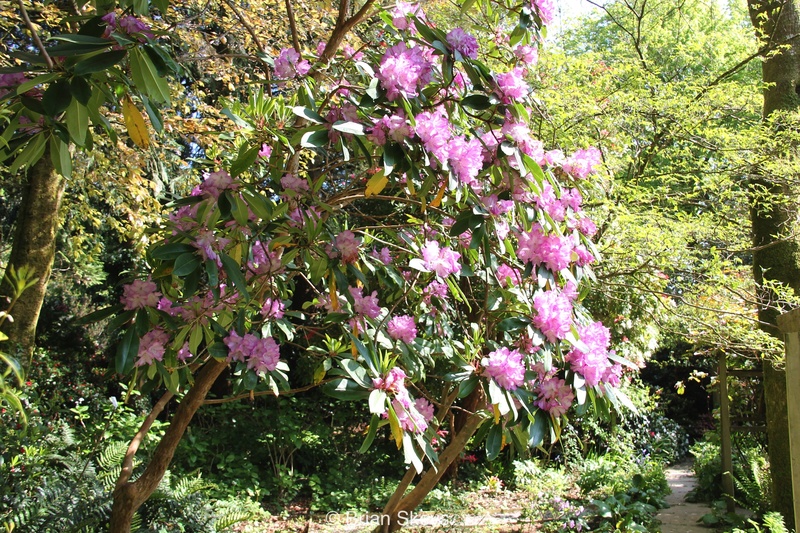 “The garden at Moyclare was established in 1927, and hosts a fine variety of plants, shrubs and trees in one acre of sheltered flat ground around the house. 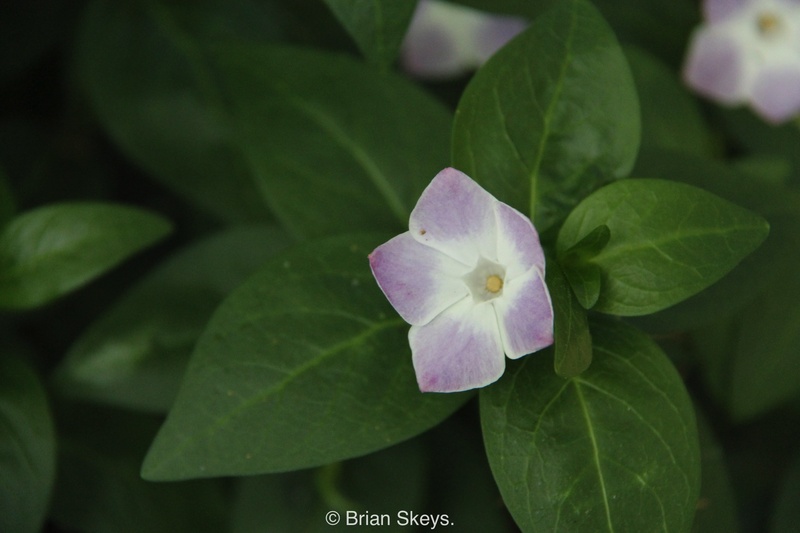 Many are unusual and some are quite rare. 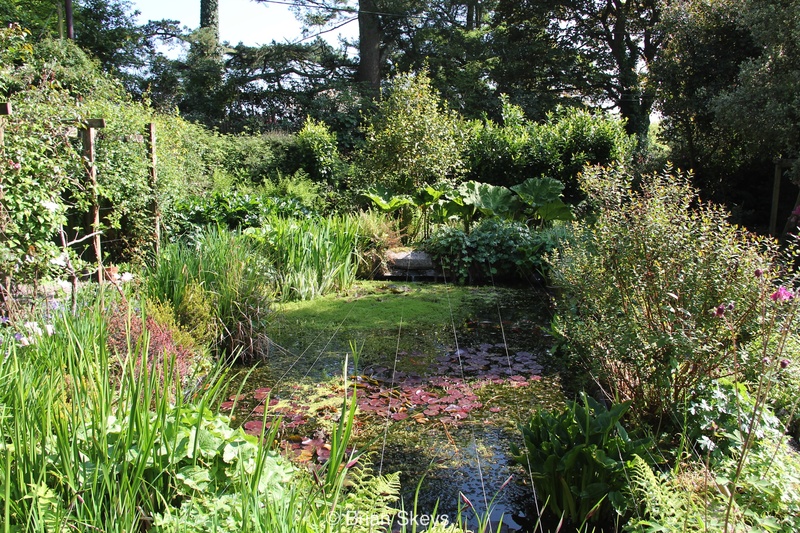 The garden was first planted by Moira Reid, and is now in the care of Elizabeth and Philip Henslowe. 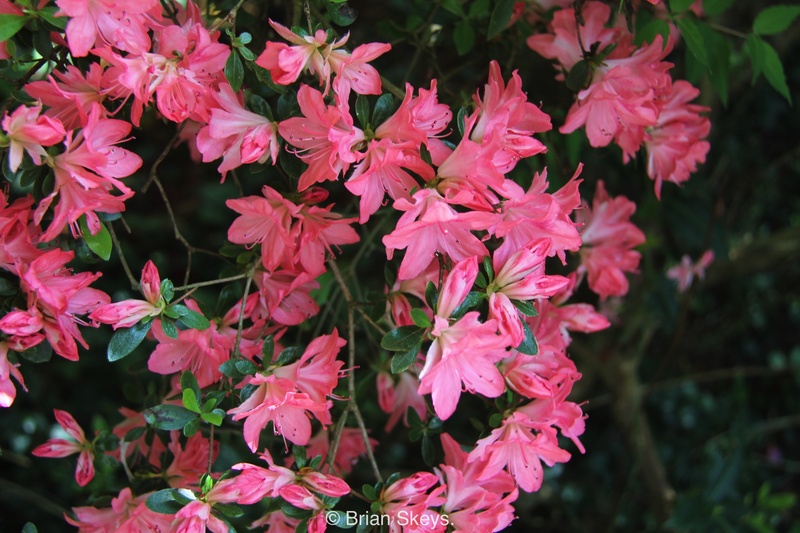 On entering the garden the first plant to catch my eye was Azalea Amoena, in full flower. 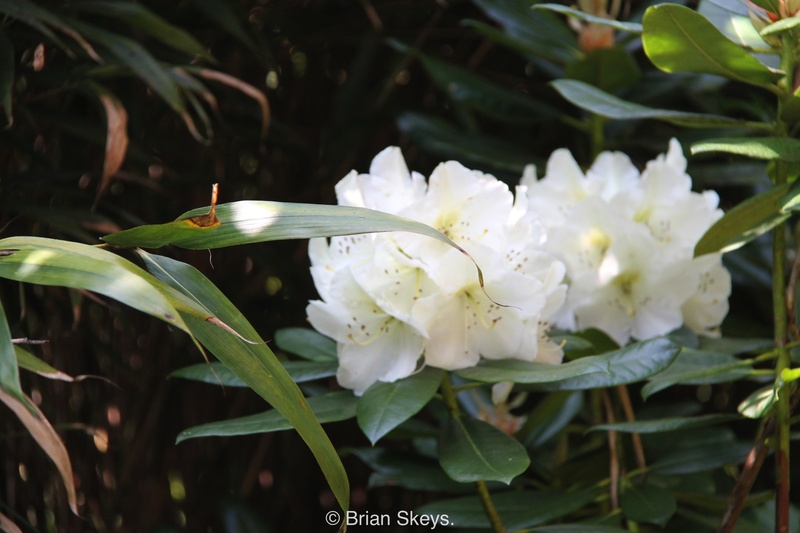 …predominantly camellia, rhododendron and azaleas. 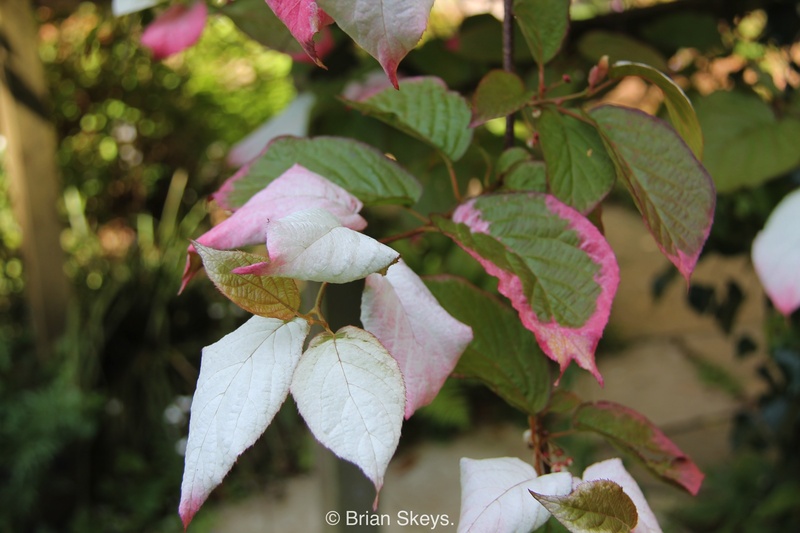 We gardeners know that our gardens are constantly changing, although not always planned. 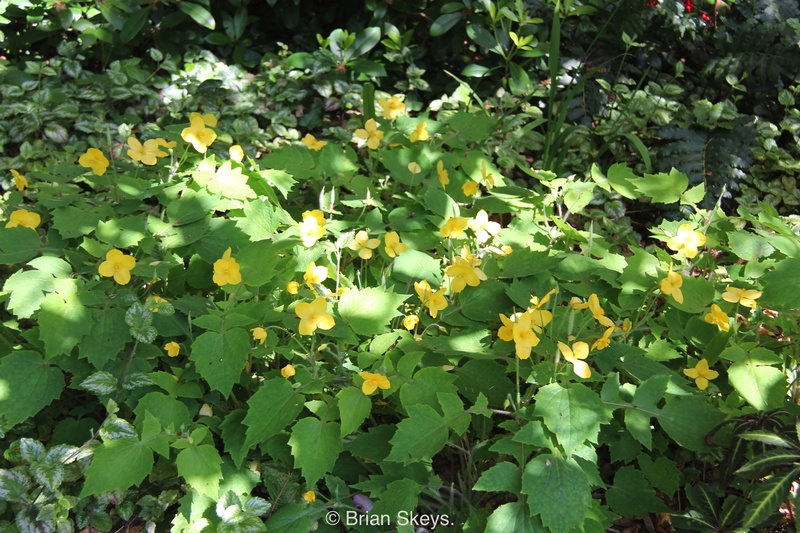 Another unusual ground cover plant brightening up the garden understory was Stylophorum lasiocarpum. 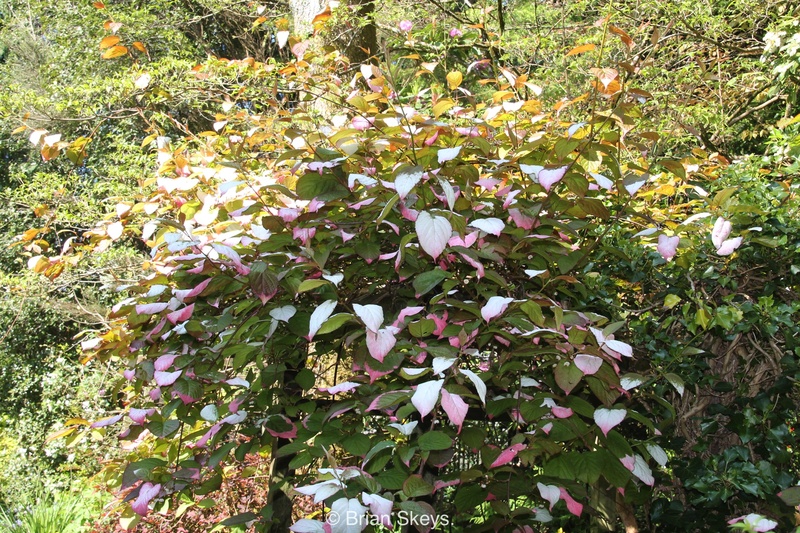 …commonly known as the variegated leafed hardy kiwi. 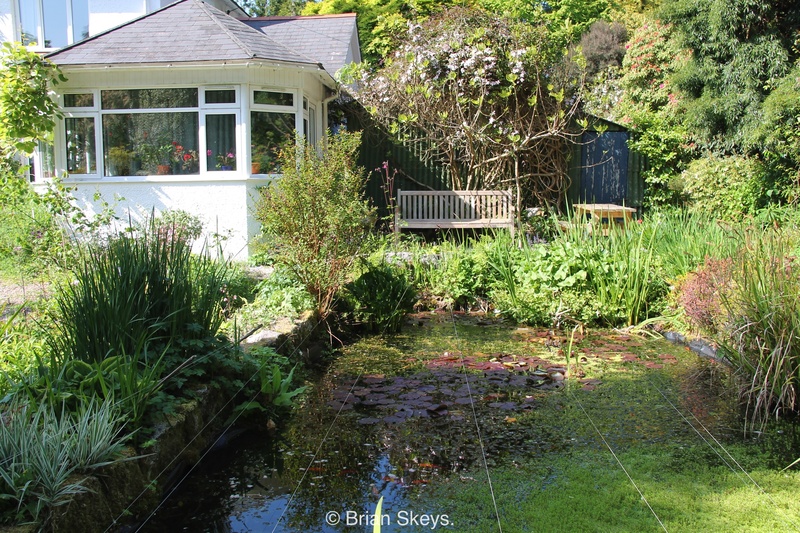 The pond is home to goldfish and much aquatic life despite the efforts of the local heron. 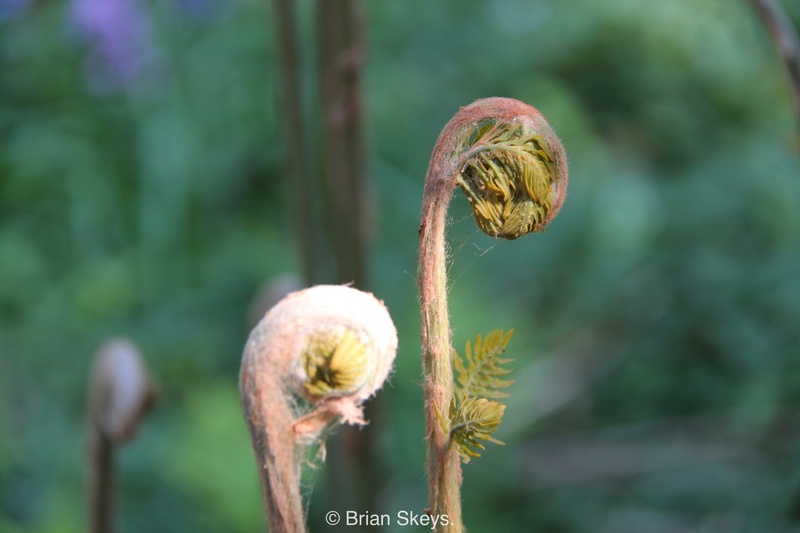 The young crozier shaped fronds in a huge clump of Osmunda regalis were asking to be photographed. 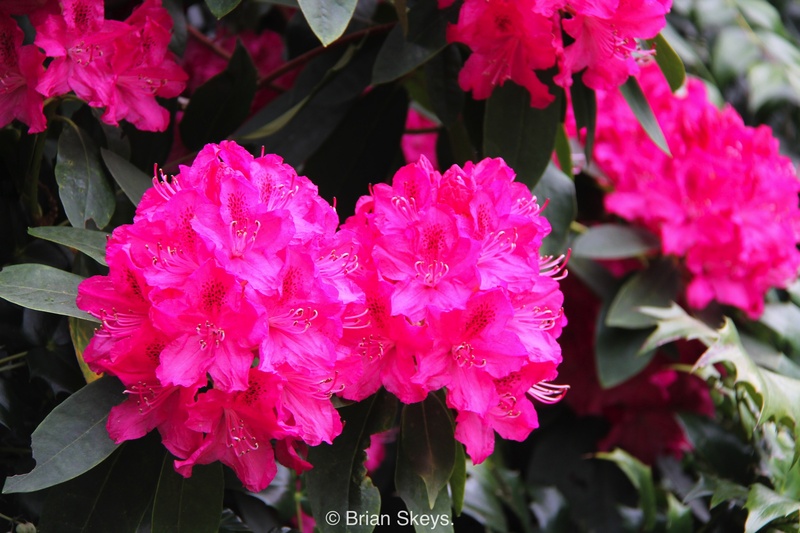 The red flower to the right of it is the Rhododendron ‘Winsone’. 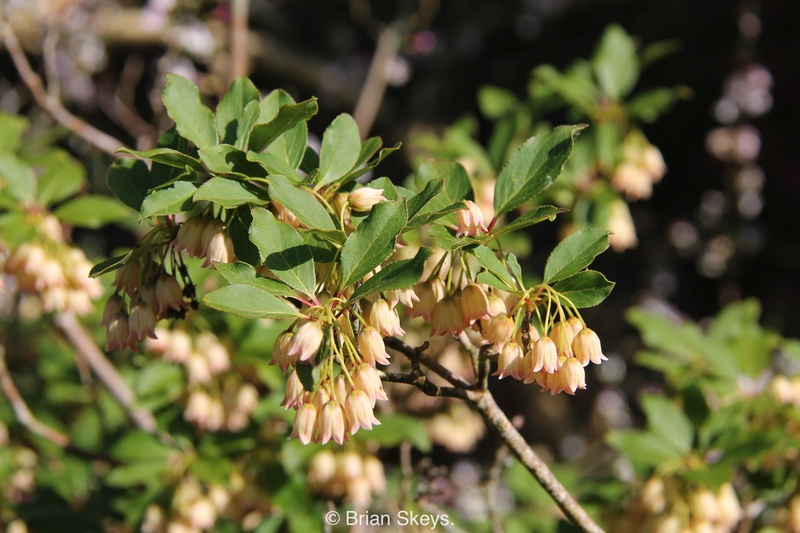 To the left in the border was a Enkianthus campanulatus, living up to its name with beautiful little bell shaped flowers. 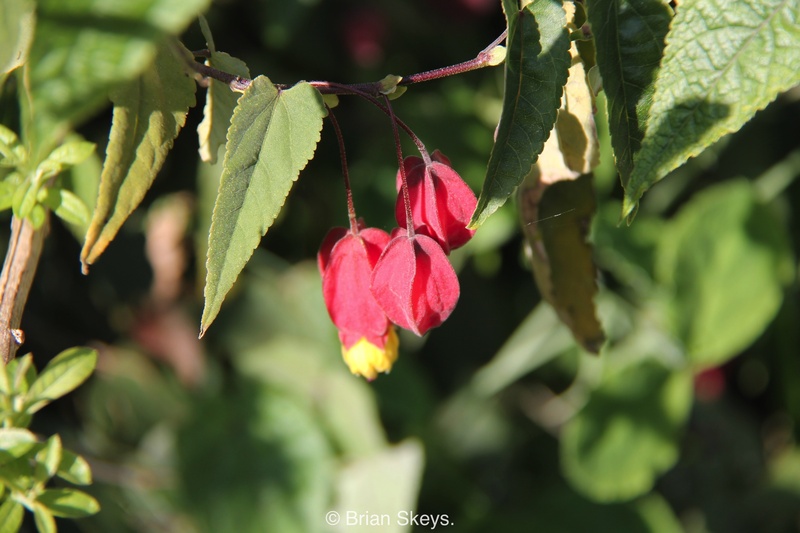 The terrace facing the south lawn is home to many tender plants such as the Abutilon megapotanicum, which blooms freely, it has also produced a seedling or sport of a new taller Abutilon. 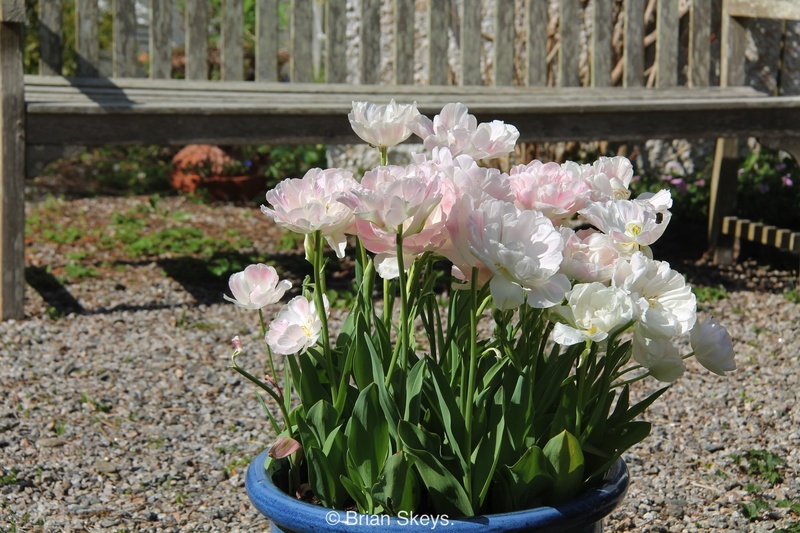 In pots on the terrace and planted around the garden was the late flowering tulip Angeliue, which Irene was very taken with. One for next years bulb order. 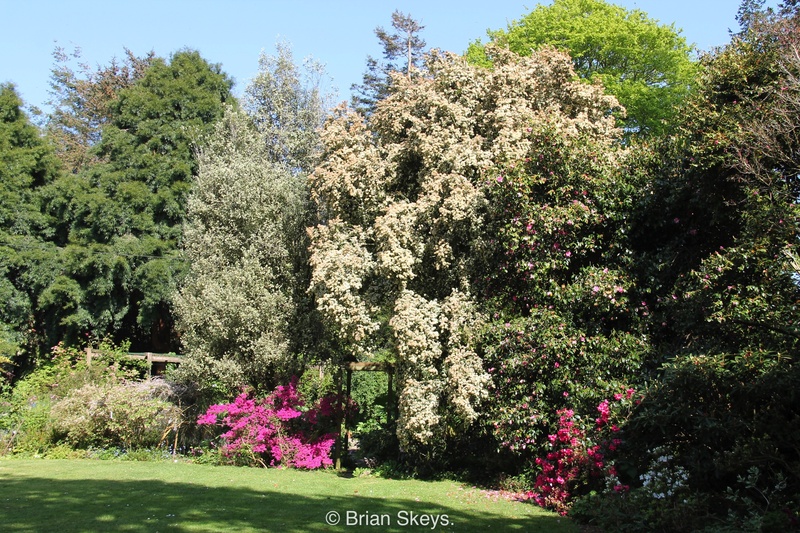 The current owners Elizabeth and Philip Henslowe made us very welcome, Elizabeth is justifiably very proud of the garden and the unusual plants it contains and she has an enviable depth of plant knowledge. 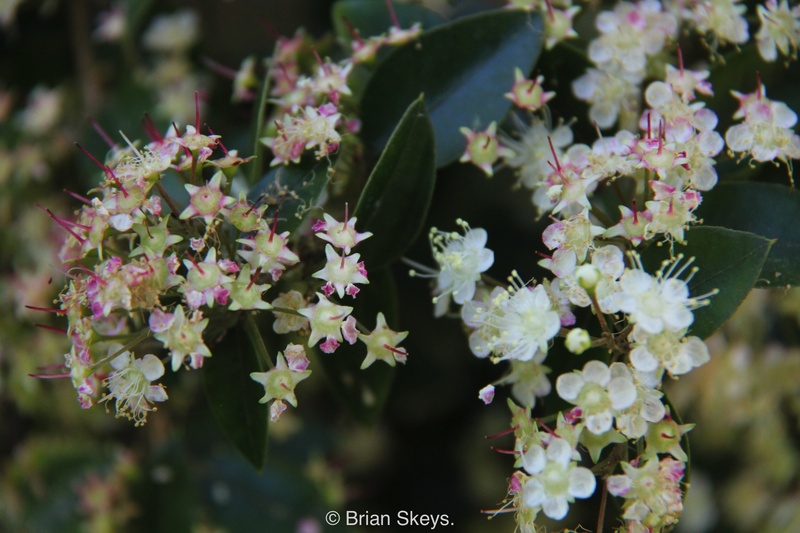 Several new plants have been discovered within the garden over the years some of which have been propagated and sold by The Duchy of Cornwall Nursery. 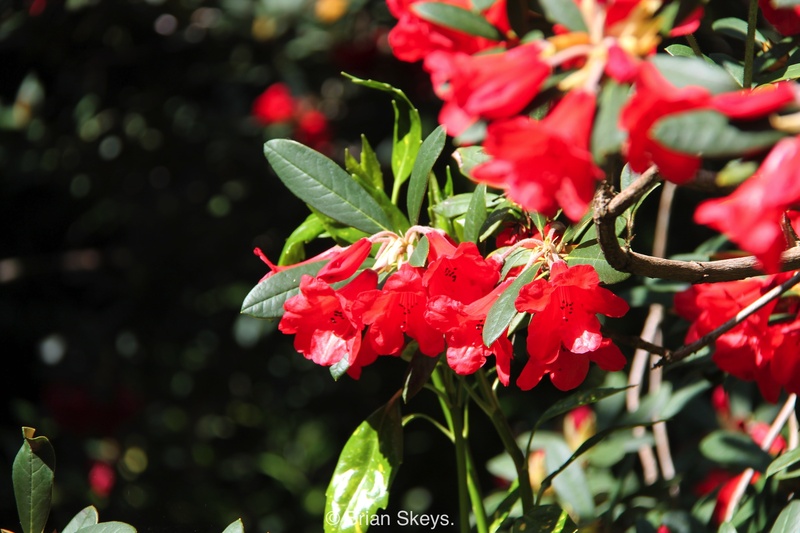 Moyclare is a wonderful garden to explore, you literally find gems around every corner. The garden does have the ‘Wild garden’ look, a style of garden I much admire, very William Robinson, I thought, perhaps that is due to the Irish connection. If you should be visiting the area please check the website here for opening times. Tea and cake is available along with a chance to purchase some of the rarities (and not so rare) plants growing in the garden. 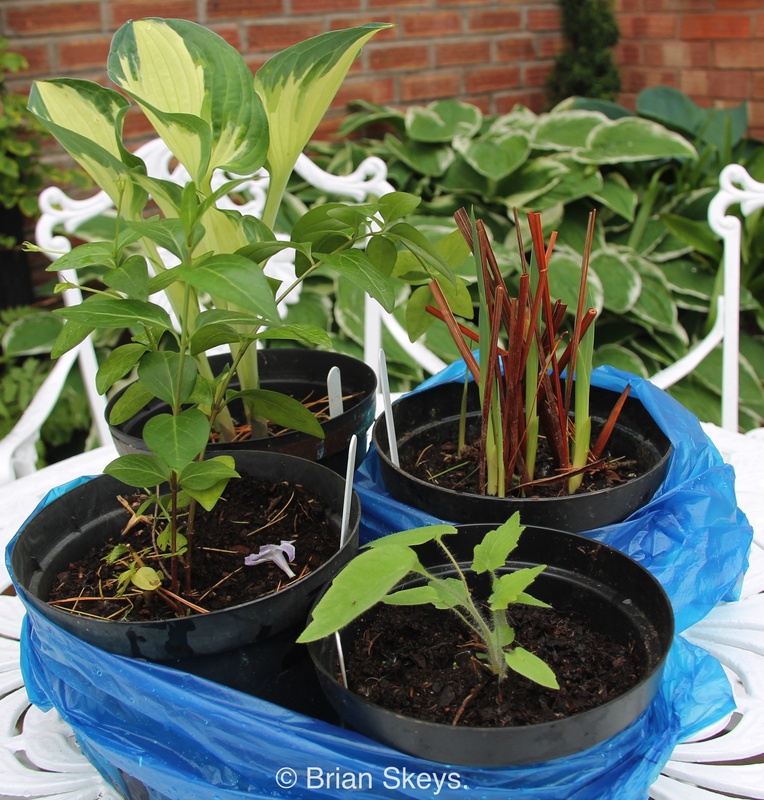 Hosta ‘Whirlwinds’ Gladiolus ‘Papilio’ Vinca ‘Jenny Pym’ Stylophorum lasiocarpum.